NewsBTC is a Bitcoin news service that covers cryptocurrency news, technical analysis and forecasts for bitcoin, litecoin, dash, doge & digital currencies. The post Crypto Market Wrap: Unstoppable Binance Leading Markets Back to 2019 Highs appeared first on NewsBTC. The post Bitcoin Price Watch: BTC Primed For Lift-off To $5,500 appeared first on NewsBTC. Despite this, Bitcoin may be currently incurring strength that will allow it to surge up towards $5,800 – at which point it will likely find greater levels of selling pressure. XC, a popular cryptocurrency trader on Twitter, shared his thoughts on Bitcoin in a recent tweet, explaining that he expects BTC to see another “scam move” up to the upper-$5,700 region, at which point it will be pushed back down. “Seeing weak bearish moves all across the board here, think we get one more scam move up with a harsh peak around 5777,” he explained. One pattern that traders and analysts alike have been closely watching is the “golden cross” that Bitcoin is currently en route to forming. Previously, this pattern was only hypothetical, but it now appears that BTC will in fact make this formation, which would be highly bullish for the cryptocurrency. One analyst believes that the formation of this pattern will lead to massive volatility that could either send Bitcoin’s price surging upwards or reeling downwards – depending on whether bulls or bears take this opportunity to strike. “$BTC. Golden cross trajectory now April 24. (Was previously April 25). Should be interesting. Lot of hype that this is the “bull run” signal. If I were a bear or bull whale, that’s when I’d strike. Bull whale rides momentum of GC traders. Bear whale destroys their morale,” B.Biddies, another popular crypto analyst, explained in a recent tweet. $BTC. Golden cross trajectory now April 24. (Was previously April 25). Should be interesting. Lot of hype that this is the "bull run" signal. If I were a bear or bull whale, that's when I'd strike. 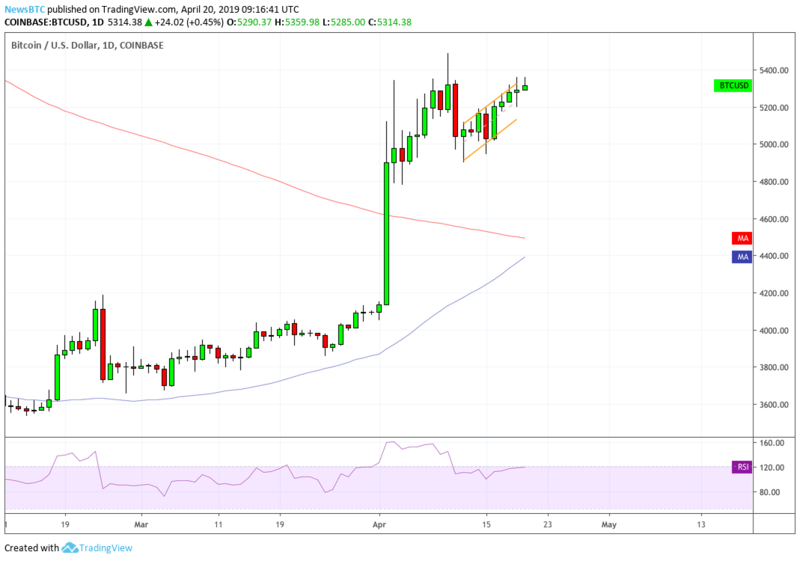 The post Analyst: Bitcoin (BTC) Likely to Soon See Massive Volatility as Golden Cross Pattern Forms appeared first on NewsBTC. It’s no secret that over the past several decades politics in the United States have become increasingly about appealing to voter blocks, and regardless of whether or not this is good or bad, this trend may ultimately prove to be beneficial for the crypto industry. Because the number of cryptocurrency investors in the United States is actually quite large on a percentage basis and will likely continue growing along with the markets, it is highly likely that more and more candidates for influential public offices will begin placing cryptocurrencies on their list of priorities to address. According to a study published in March of last year, 8% of Americans are currently invested in cryptocurrencies. Although it is highly likely that this number has changed in the year since the report was first published, the lack of any significant changes in the overall markets has probably led this number to remain relatively stable. Some candidates for elected offices are already taking note of the portion of citizens who are invested in the nascent technology, and although 8% seems like a small number, gaining a voter block of that magnitude for a national election could sway the results. Moreover, as this number grows – which it undoubtedly will, assuming that the crypto markets continue to expand – it will be critical for candidates to acknowledge these investors by presenting solutions to the regulatory problems the industry currently faces. Recently, Andrew Yang – a candidate running for the presidential office in the 2020 race as a Democrat – laid out his thoughts on cryptocurrencies, lambasting New York state’s BitLicense while advocating for a “do no harm” approach that allows the United States to remain on the forefront of innovation in the rapidly evolving industry. In the post, Yang explains that the crypto market’s growth over the past several years has outpaced the government’s response, making now a critical time to begin implementing regulatory frameworks. “Cryptocurrencies and digital assets have quickly grown to represent a large amount of value and economic activity. This quick growth, however, has outstripped the government’s response… It’s time for the federal government to create clear guidelines as to how cryptocurrencies/digital asset markets will be treated and regulated so that investment can proceed with all relevant information,” Yang explained. “Some states have onerous regulations in the space, such as NY’s BitLicense. Navigating this has had a chilling effect on the US digital asset market,” he wrote. As to how he plans to go about implementing the proposed regulatory framework, Yang explains that if he were to be elected, he would offer better definitions for what a token is and when it is a security, and would clarify the tax implications of buying, selling, and trading crypto, among other things. Although Yang may currently be somewhat of a dark horse in the presidential elections, his friendliness towards cryptocurrency has already garnered him publicity and support amongst crypto investors and may spark a larger trend of other mainstream presidential candidates laying out similar frameworks to incubate growth within the crypto markets. The post As More Investors Flock to Crypto, Will US Presidential Candidates Start Making it a Priority? appeared first on NewsBTC. In a new data visualization making its way around social media platforms, it shows the growth of trading volumes across top exchanges since the beginning of 2017. It also demonstrates just how rapid Binance’s rise to the top has been. Binance seemingly can do no wrong in the eyes of the crypto community. While many exchanges are spoken of with a negative connotation, Binance is loved by most. The firm recently launched its own blockchain, and its native crypto token Binance Coin has been among the most successful investments in the space throughout the year. Most recently, Binance led a charge to delist Bitcoin SV due to controversy surrounding the project’s supporters. Before these recent events unfolded, Binance gained a reputation for thwarting hacking attempts, and in general being a positive contributing member of the crypto community, offering up hacker bounty programs, donating to charities, and much more. Binance also has among the largest varieties of altcoins, has its own launchpad program for new projects, which saw strong interest with the launch of the BitTorrent Token. Together, along with valiant ethics, clear transparency, brilliant leadership, and sound business strategy, Binance has grown to become a force to be reckoned with in the crypto industry. A new data visualization designed by Blocktown Capital, shared via Twitter, shows Binance’s incredible journey to the top through the growth of cryptocurrency trading volumes across top exchanges in the crypto market. The video shows that Bitfinex had once enjoyed a comfy number one spot throughout most of 2017. It’s not until December when Binance really explodes onto the scene, and rockets past most competitors. It was the Bitcoin bubble peak and the following capital outpouring into altcoins seeking “the next Bitcoin” that made Binance an interesting proposal, but it was Changpeng Zhao’s vision, leadership, and connection with the cryptocurrency community that’s helped his company solidify a position as a leader in the market. It’s not clear who inspired who or that the data visualized across the two videos are simply coincidental, it’s a fun way to digest historical data. Similar to the above video depicting crypto trading volume growth across exchanges, the below does the same across the top ten cryptocurrencies by market cap over the last 6 years. Just 10 years ago first #Bitcoin transaction was sent and it’s astonishing to see industry growth and how many new assets have gained traction. As you can see, the battle is fierce, with many cryptos falling out of fame never to return, while others remain dominant today. The post Crypto Chronology: Watch the Rise and Dominance of Binance Unfold appeared first on NewsBTC. At spot rates, the crypto market is far from the $880 billion valuation of late Dec 2017. Even so, as Bitcoin (BTC) prices recover, bottoming up and closing above $5,000, odds are the next wave would thrust BTC above $6,000 as our trade conditions become valid. That there is a movie dedicated to crypto shows how the public is aware of Bitcoin and other leading coins. The truth is that this new-age investment is worth it. Institutions are shifting their stand from conservative and angling at clipping part of this burgeoning market. Concurrently, regulators are drafting laws supportive of blockchain applications while at the same time protecting investors. Their decision is bullish. After 2017 parabolic rise where investors from all over the world channeled their hard-earned monies to projects that are emerging to be frauds only to be followed by a cold winter that wiped out more than $600 billion in the space draining investors’ will to participate further fuelling the sell-off, the cautious stand adopted by these practical regulators was necessary. Presently, the market is recovering, and as prices range above $5,000, analysts expect this state of affairs to continue for sometimes. Luckily, their projections are positive, waiting for a stronger break and close above $6,000 as prices rally towards $8,000 the longer the range mode. Price wise, Bitcoin (BTC) is up 4.6 percent. However, it is poised to add more in days ahead now that prices are trending above $5,000 thanks to events of early April. In line with our last BTC/USD trade plans, buyers are in control, but once there is a conclusive reversal of Apr-11 bears confirming buyers of Apr-2, then traders should align their position in expectation of the next wave that would lift prices above $5,500 towards $6,000 as reiterated before. Note that the momentum is high and as prices reverse from the 38.2 percent Fibonacci retracement mark anchored on the break and close above $4,500 from Apr-2 through to Apr-10. The only move that nullifies this course are losses below $5,000, with high volumes exceeding those of Apr-11. Our anchor bar is Apr-11, and it has high volumes of 19k. Recent averages stand at 9k, but if prices close above $5,500 with equally high volumes above Apr-10 highs, then conservative traders can initiate longs with targets at $6,000. The post Whales, Moon-sling Calls, But Will Bitcoin (BTC) Clear $5,500? appeared first on NewsBTC. Wind is an advocate of Ripple, and his company is one of the many funded by Xpring. If there is adoption, XRP prices would likely edge higher as demand for the third most valuable coin spike. As we have reiterated in our analyses, cryptocurrencies need adoption to thrive. Day-to-day use means acceptance, and if one coin goes mainstream, then its value will surely skyrocket. We are talking about 10X gains and even $579 the ever-supportive XRP army believe the coin is worth. Even so, XRP is struggling and yet to close above essential resistance levels perhaps bogged down by fundamental factors. Note that the market is up and lifting altcoins is Bitcoin, which is steady above $5,000. However, Ripple (XRP) is under-performing despite temporarily rallying yesterday. From a fundamental point of view, development around XRP use case will surely lift prices. A case in point is Wietse Wind’s development and acceptance of an XRP Payment App that got the nod from Apple and Google Play store allowing XRP holders to spend the coin. Right on time! Our XRPayments app was just accepted by Google and Apple. You can get the app now from the Apple iOS or Google Play store, and start accepting $XRP for payments in your physical store! What is unique is that payment is directly from the ledger or via the XRPTipBot and all you have to do is specify the amount in any currency and the app will convert that into XRP. From price action, Ripple (XRP) is down 1.1 percent, reversing yesterday’s gains. Even so, we retain a neutral but bullish stance aware that once prices rally past 34 cents, then the first wave of buyers shall be free to initiate their longs with primary targets at 40 cents. It is easy to see why. First, notice that the 34 cents tag not only marks the tops of the recent consolidation but is also the 61.8 percent Fibonacci retracement mark. Therefore, if buyers are successful in driving prices, then bulls of Jan 30 would be back in a trend continuation phase. After that, chances are prices will expand towards 40 cents as buyers of early April flow back in a wave that will finally unlock bulls, breaking free from the last four months consolidation with caps at 40 cents and supports at 30 cents. In light of recent developments, our anchor bar is Apr-11. Behind the drawdown is a spike in transactional volumes causing prices to fluctuate by wide trade ranges. With high volumes accompanying the bear bar—32 million, bull trend confirmation must be at the back of equally high transaction volumes exceeding recent averages of 20 million and ideally above 32 million. Once these trade conditions are valid and prices trend above Apr-11 highs, then aggressive traders can begin loading up with modest targets at 40 cents. The untimely death of QuadrigaCX CEO Gerald Cotten has left $190 million worth of customers’ crypto funds inaccessible. Many theorized that Cotten faked his demise to disappear with the money. But according to his former friend and colleague, the late entrepreneur was not capable of taking such drastic measures. Cotten’s widow Jennifer Roberston wrote in her affidavit that Cotten died of Crohn disease while taking a humanitarian trip to India’s Jaipur town. The local police issued a no objection certificate, confirming the circumstances surrounding Cotten’s demise, before sending his remains to Nova Scotia. The conspiracy theories about Cotten faking his death ended right there. But the fact that Cotten did not pass down the passwords of wallets that held $190 million of customers’ funds with a trustworthy party raised doubts. A dead man’s switch is a computer program which transfers a human operator’s security credentials to a priorly designated receiver over non-activity for a specified period. So, for instance, the operator dies unexpectedly or fails to interact with his machine for a long time, a dead man’s switch automatically passes down the information to the next person in line, ensuring that data remains accessible to a human. So far, investigators have unable to find out whether or not Cotten had a dead man’s switch system in place. If yes, it was necessary to find the person who might have gained access to QuadrigaCX missing millions following Cotten’s death. It was particularly stressing since one of the co-founders associated with the Canadian exchange had a criminal record in the US. Legal documents proved that the accused Omar Dhanani had changed his name to Michael Patryn to conceal his past. O’Brien believed the affected 115,000 QuadrigaCX customers would not be able to recover their funds, solely because the way crypto technology worked. “I don’t think people are going to see that money again. And the reason I don’t is [that] the way bitcoin is designed is that once the private key is gone, there’s no recovery,” O’Brien said. The post QuadrigaCX CEO Lost $190 Million in Crypto, Former Friend Says He Was Fearful appeared first on NewsBTC. It isn’t a secret that the past few weeks in the crypto ecosystem have been tumultuous ones. As Bitcoin (BTC) rallied past $5,000, sparking claims that the bottom is in, Australian cryptographer Craig Wright and his crew, all fans of Bitcoin Satoshi’s Vision (BSV), found themselves in a few tussles on Crypto Twitter. It wasn’t exactly pretty. The online beef went so far that Wright looked to bring the discourse to the real world, purportedly sending letters of intent to sue/bring legal action against his countless critics. Ethereum creator Vitalik Buterin and Hodlonaut, the creator of the Lightning Network Torch project and a catalyst for newfound adoption, were two entities reportedly served. Although it wasn’t confirmed whether or not the said letters reached the desks of their targets, the crypto community quickly expressed their distaste for such an act. After Hodlonaut’s Twitter page was shuttered, users across the cryptosphere began to rally to the user’s side, shunning Craig Wright, Canadian entrepreneur Calvin Ayre, and their legal team for enlisting such a scare strategy. After Peter McCormack, Matt Odell, and other prominent Bitcoiners bashed the BSV camp, Changpeng “CZ” Zhao joined in on the action. In a brief Twitter post, the Binance chief executive asserted that if there was any more of this “s*it,” writing in reference to the legal action, he would delist the crypto asset that Wright holds so dear. And it appears he wasn’t kidding. As NewsBTC reported on Monday, days after Zhao’s promise, the Malta-registered exchange actually took action, making good on its semi-threat. Binance posted a blog post that morning, which outlined that BSV doesn’t meet its standards, and would thus be delisted by April 22nd, just over a week away. Hours after Binance’s announcement, other prominent crypto startups followed suit. In a statement of approval, Erik Voorhees, an anti-establishment figure that heads the instant crypto trading platform ShapeShift, claimed that his firm stands by Binance. He claimed that within 48 hours of him publishing the tweet, ShapeShift would remove support for trading Bitcoin Satoshi’s Vision. Hours later, wallet provider Blockchain.com followed suit. Binance’s and Blockchain’s removal of BSV is arguably a huge blow, as the two firms are the biggest exchange and the most widely-used crypto asset wallet respectively. But this might be just the tip of the iceberg. In a poll published early Monday, the team at Kraken, the fourth largest BTC exchange as per Bitwise’s list of bonafide platforms, asked if they should follow Binance’s footsteps. The response to the poll was overwhelmingly positive, with more than 70% of 50,000 voters requesting for BSV’s removal from the popular site. Considering that Binance, ShapeShift, and Blockchain have set a precedent for the sudden removal of a cryptocurrency, and a leading Bitcoin fork no less, Kraken may soon follow through. While the delistings from the aforementioned upstarts have been widely lauded, Calvin Ayre of the BSV camp recently took to Twitter to express that Binance’s sudden act, for instance, is “illegal and corrupt.” But is this true? As far as I'm concerned, crypto exchanges are private companies under no obligation to list any particular asset & there's nothing bad about a delisting based on broad social consensus. Some people complaining today were also calling for delistings of scam ICOs two years ago. Alistair Milne, a Bitcoin investor, echoed this sentiment, writing that no coin, even Bitcoin itself, has an inherent right to liquidity, fiat on-ramps/off-ramps, wallets, and infrastructure. Could This Debacle Be Hurting Crypto? Although the removal of BSV is well within exchanges’ rights and could be deemed logical from a business standpoint, respected analyst Alex Krüger argued that this imbroglio hasn’t done much to aid the reputation of crypto. In fact, he quips that from the perspective of institutional stakeholders, the “Satoshi squabble” and BSV delisting makes the industry look “like a children’s playground,” instead of a cohesive group of professionals. Almost everybody in crypto may be celebrating the delisting, yet from the perspective of institutional investors, the Satoshi squabble and the delisting should make the industry look like a children's playground. Krüger continued, writing that a delisting’s equivalent in traditional markets could take the form of an investment bigwig dumping assets of a company “perceived to be ‘misbehaving’ environmentally.” This, of course, is a nonsensical and overblown reaction to a potential non-issue. While Calvin Ayre & Co. have begged to differ, claiming that Binance’s leadership are adolescent, the majority of stakeholders in this space have agreed with Hoskinson’s comment, and signal boosted the message with their personal spin. The post Is the Whole Bitcoin SV Incident Hurting the Image of the Crypto Industry? appeared first on NewsBTC.